Baskets by Donna, LLC has been providing personalized unique gift baskets for special occasions since 2005. We make your gift memorable for that important person who’s having a birthday, shower, wedding, celebration, illness, anniversary or a holiday. You can trust our service will provide the highest degree of quality and reliability. Our friendly and professional staff answers any questions you may have and make ordering for that special person a great experience. Whether you need gift basket to say “Thank you”, or “I’m sorry”, we have the quality you need at prices you can afford. At Baskets by Donna, our goal is to earn your trust and exceed your expectations. Contact a Baskets By Donna representative now by e-mail at basketsbydonnapa@aol.com or call us at (610) 690-7449. At Baskets By Donna, your satisfaction always comes first! 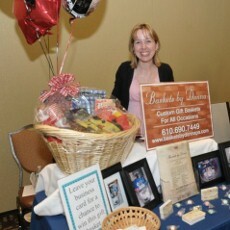 Donna Mallon (Owner of Baskets by Donna) at a Delaware County Chamber of Commerce event. Baskets by Donna has been a proud member of the Chamber of Commerce since 2006.